About us: The Marion County Park District was formed in 1995, when Trella Romine suggested to the Marion County Commissioners that a park district be set up to accept her donation of the land that is now Terradise. The commissioners enthusiastically supported this idea, and three volunteer park commissioners were appointed by the Marion County Probate Court. In 1996 land was donated by Judge Charlton Myers, and Myers Woods was the first county park property. Trella Romine quickly followed with a donation of property at Terradise, and the village of Caledonia donated the Caledonia Nature Preserve. For the first few years, the park district was run solely by volunteers. The first employee, Jack Telfer, was hired in 1998, and we continued to have a park director (most recently, Karen Kelley) until 2011. After four years of relying solely on volunteers, including the Friends of the Prairie Parks, we hired naturalist James Anderson on a part-time basis in May, 2015. The Marion County Prosecutor's office generously provides legal services when needed. The park district is a political subdivision of the state of Ohio, serving all of Marion County, including the area within townships and municipalities. The park commissioners normally meet once monthly, at noon on the third Thursday of the month, in the Prospect Room on the lower level of the Marion County Building (southeast corner). These meetings are open to the public. Jim Beaver serves as ex-officio treasurer for the Prairie Parks Foundation. Volunteer, and make a difference! Join the Friends of Prairie Parks. Click here for more information. We greatly appreciate the generous support of the Marion County Commissioners, Andy Appelfeller, Ken Stiverson, and Kerr Murray, and of Judge Robert Fragale, who appoints park board members. Community members join Marion County Park Board members to celebrate “Twelve Miles of Thanks” on October 21, 2017. 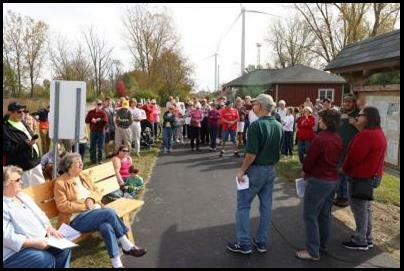 This event celebrated the completion of the Tallgrass Trail to the county line.